Our second day in Naantali was spent at Moominworld, recommended by our friends and somewhere they said we had to visit. Son was not too familiar with the Moomin books and stories but we quickly rectified that before our trip to Finland. Then we set out on a sunny Saturday morning to meet these creatures first hand. 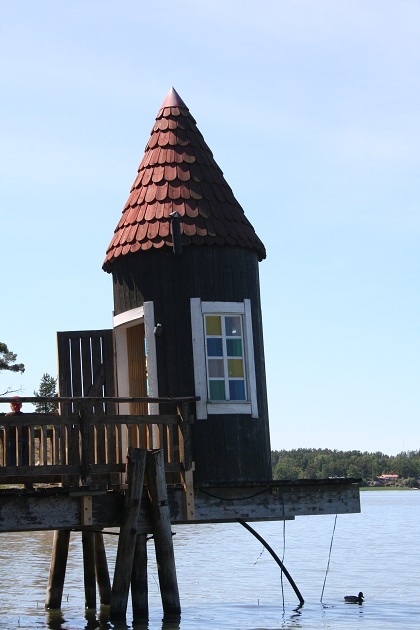 Moominworld is on a little island and is just a hop, skip and a jump from Naantali marina. The whole place is based on books by Tove Jansson where the Moomins live on their own island and look like big white hippos without noses. First tip is not to go on the weekend. The whole place was absolutely packed and crammed with families and excited children. It is apparently fairly quiet during the week – I had not done enough pre-trip homework on this one or used any common sense. We ended up queuing in a very slow moving line for in excess of forty five minutes just to buy the tickets. Not the best start with an over-excited and very impatient three year old in tow. Any grumpiness we had though swiftly evaporated as soon as we walked through the gates. This is the most gorgeous natural location for the attraction. There are pine forest trails leading to picturesque little beaches and inlets. Here and there along the way are the Moomin attractions. “Newspapers” were being handed out at the entrance which were actually guides to the park with maps and details of shows going on throughout the day. They were in Finnish and Swedish but when we specifically asked they did manage to locate some English copies for us. 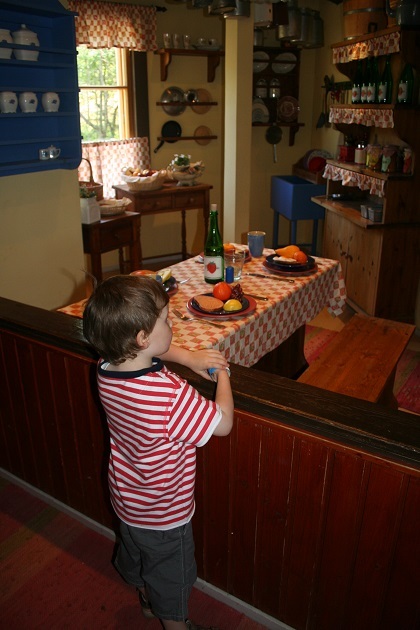 The blueberry coloured Moomin house is the main attraction. You can explore inside and climb up and visit all five levels. We also found a ship, fire-station, camp and a yellow house. This is not a theme park, there are no rides but that suited us just fine. What you get here and what we loved so much was the lovely scenery and some quirky places for children to play and explore. 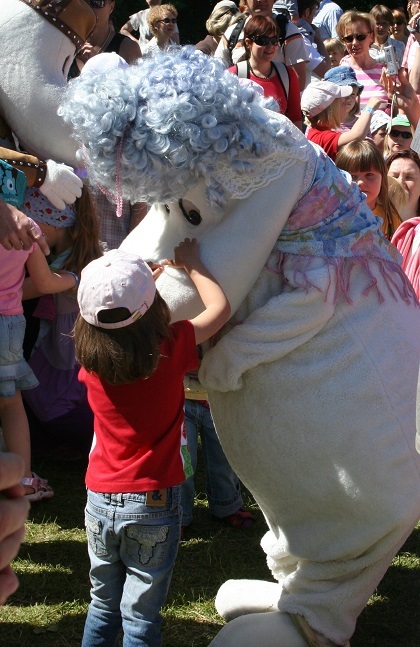 There were plenty of opportunities to meet the Moomins but the creatures were mobbed by young children as soon as they appeared. That was fine by us too, on catching a glimpse of his first Moomin, Son was completely and utterly freaked out and would go nowhere near them. So while everyone else was in a crush to get close, we had the attractions nearby virtually to ourselves – win win. We brought a picnic and ate on one of the little beaches while Son paddled in the sea. There are no restrictions on food and drink being brought into the park. The park is only open June to August, we spent five hours there in total – a perfect amount of time for us to do everything. 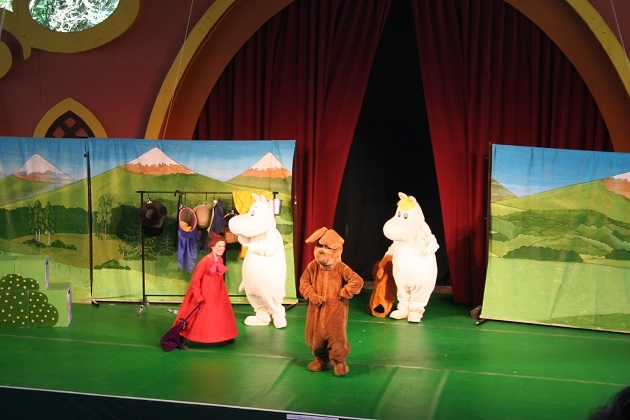 We explored the forest trails, saw the Moomin attractions, spent leisurely time on the beach and watched a Moomin show at the theatre. 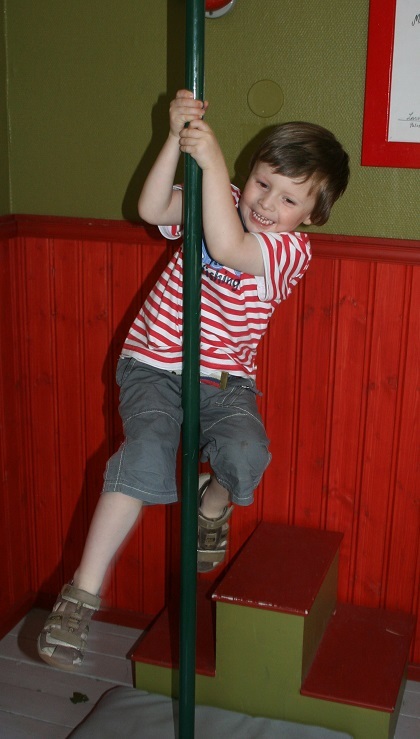 The plays were in Finnish or Swedish – Son understood not a word but enjoyed every second. 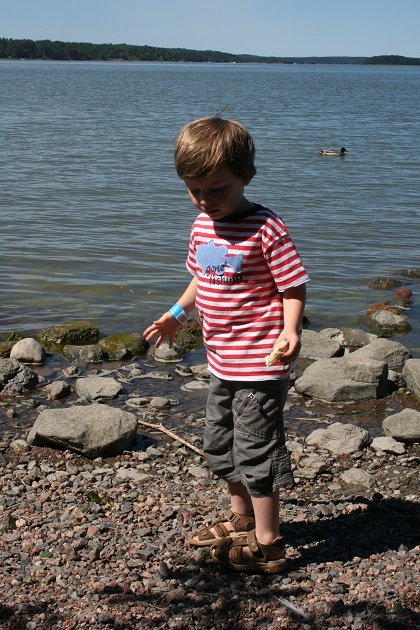 The Moomins were far enough away too…. I remember reading before this trip in one of our newspapers that this was one of the world’s best theme parks. Misleading I think and people should not go to Moominworld expecting a theme park. What we got was the most wonderful relaxed and pleasant day out in a beautiful nature lovers’ paradise with some attractions thrown in specifically for younger children. It is just perfect. Oh your little ones would really love it here Rosemary, it is the most wonderful place for young children even if they’re not familiar with the Moomin story books. I can’t remember where we got our books from but I’m sure you must be able to get hold of them on the internet somehow, they are lovely stories. Sun is shining here at the moment and I think it is going to stick around!! Hope you have a wonderful weekend too – you must be on the countdown now to coming over! We went on a Saturday and I was kicking myself afterwards. 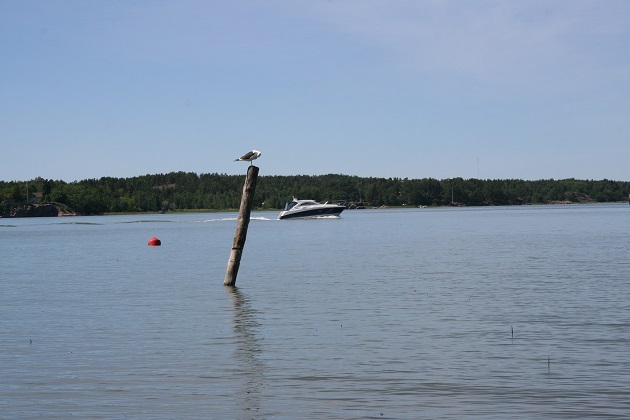 We arrived in Naantali on Thursday so should have picked a weekday! Still we did enjoy it and our son wanted to be nowhere near the Moomins so all was well! It seems a lot more like “theme parks” from my childhood … a long time ago. Rural America had places like that, which — as you say — were primarily pleasant natural settings dressed up in some “theme.” Probably not as professionally organized as Moominworld (no stage shows, certainly), but lacking million-dollar 3-D adventure rides and holographic displays and the things that constitute a theme park now. I’m glad your son had a good time, and I don’t blame him for being freaked out by those big characters. The best thing was his canny parents figuring out that the time to see the attractions was while all the other kids and their parents were distracted. It sounds exactly like that Brad and was just good old fashioned fun. We had the best day out and learnt very quickly to avoid the Moomins! I love the Moomins and have some Iitalla mugs and a biscuit jar I brought back from Finland one summer that we still use. Last summer I even spotted a Moomin cafe in the centre of Bangkok!! So nice to read about your visit and those lovely forest trails. We picked up a few Moomin souvenirs too from this trip which are still on the go! The cafe sounds like it would be a fun place to visit too – fancy it being in Bangkok!! It was a lovely day out, we all thoroughly enjoyed it and it was a “theme” park with a difference. They sound a bit like the Wombles! They are a bit for sure!! Fond memories of those from my childhood although I’m not sure I would have wanted to bump into a Womble either when I was 3!! I love, love, love Moomins (though sadly I’ve never managed to get my sons into it) and think this looks like a lovely way to spend some time in a beautiful location. I don’t like fast or high rides so this version of a “theme park” would suit me just fine. I’m exactly the same Laura – fast and high rides are not my thing, this totally was. I loved it just as much as the wee ones, it was fabulous. I am a big Moomins fan !!!!!! You would absolutely love it here!! I have never heard of the Moomins! But now I’m quite intrigued. Looks like it was a lovely setting for this, and nice that you had good weather to boot. The weather that day was glorious Corey, and the whole place was gorgeous. The Moomins were an added bonus – we weren’t so familiar with them either before the visit but the Moomin books did become a favourite with our son. How lovely post. 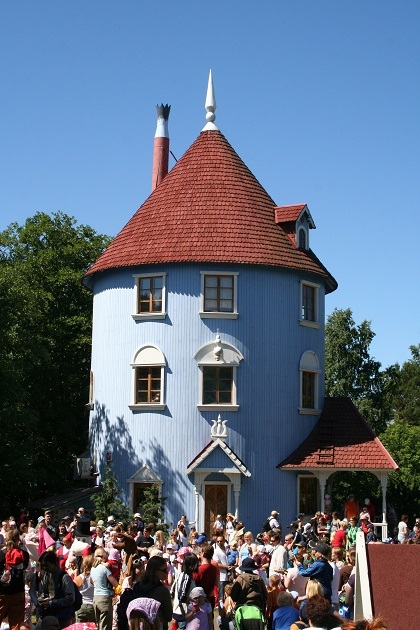 Moominworld and Naantali are wonderful places for a visit. Happy weekend! It was such a great place and we had the most wonderful day with the Moomins!! Hope your weekend is a great one too. I thought you might!! We loved it. I have never heard of Moomins. This appears to be a wonderful place for children! The crowds are certainly hard to deal with and slows down your day. 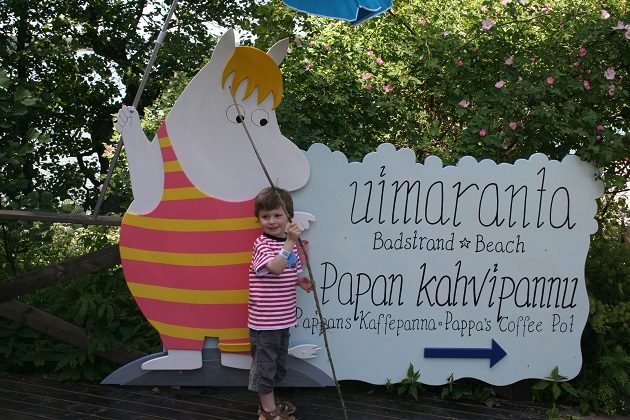 It was very crowded Pam for sure but it didn’t spoil things for us – we loved it here and our son had the best time, as long as those Moomins didn’t come too close!! 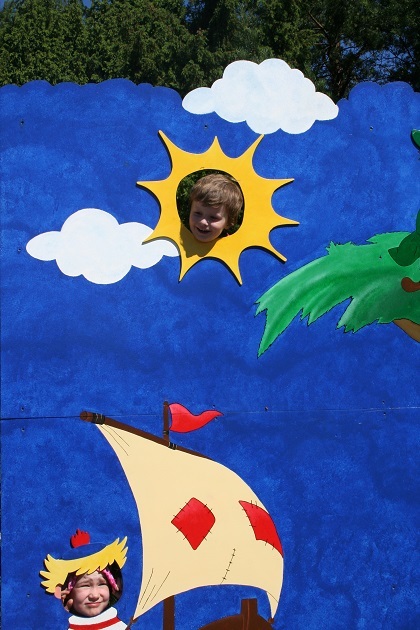 How fun that you visited Moomin world! The last time I was there was probably over 10 years ago. It’s always fun with kids in tow but we did see some Japanese tourists there without any children too. I guess they must love the Moomins!! It was 10 years ago when we visited, we loved it and thought it was the most beautiful and fun place. Thank you so much!! Glad you could come along with us, it is a beautiful place. Great post, thank you for taking me to Muumin World, I have never been there even thougg I have visited Naantali many times. Moomins are very popular in Finland, and now we even have three new Moomin cafes in Helsinki. We spent a few nights in Helsinki after Naantali – I don’t think the Moomin cafes were around then but they sound like something we’d enjoy visiting too! 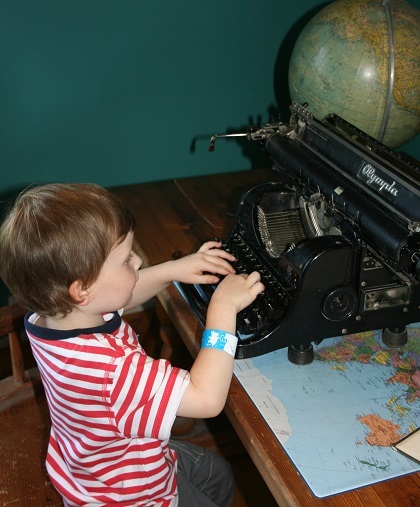 I love that using a typewriter is an “attraction!” My kids love playing with them too, it’s so strange to them! ha ha! 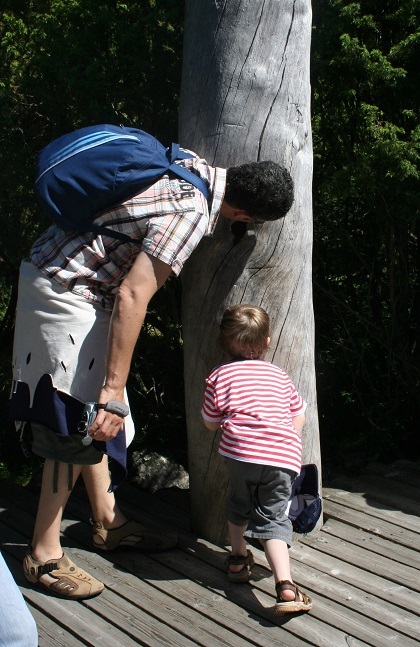 Our son was fascinated with it – I think he still would be!! The worrying thing is I used to own one!!! Me too! In fact my boys asked me to buy one just the other day! Me too George, it was such a lovely location and being by the water was an added bonus. What a great place for little kids! Very interesting post. Thanks! It really was the most wonderful and family friendly day out. I’ve not heard of Moomin either, but the place reminds me of Peppa Pig World here, and the crowds to match! Glad your son enjoyed it even though he couldn’t understand the words! Think we missed out on Peppa Pig World but it probably is pretty similar. It was fun and a really scenic place just very crowded!! 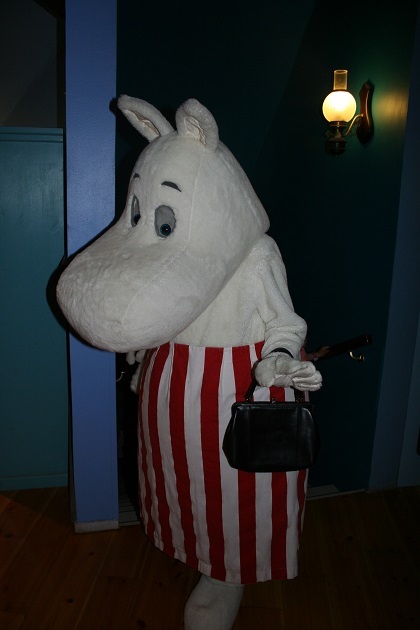 The fact our son was completely terrified of the Moomins actually worked in our favour too! I noticed they are popular with adults here too at the moment! !